Thanks to Tom Blackburn for this. Jim Fahey, world champion of the three jumps, was born in Galbally, Co.Limerick in 1880. He lived with his aunt on a farm, an ordinary life until, at the age of 18; he jumped, without shoes, against the renowned champion, Chandler, in Cork and won. His performance was recorded as 37 ft 4 ins. This was the beginning of an athletic career which was to lead him to break the world record at Calumet Park, Chicago and become an Olympic champion. That day he cleared 40 ft 3 ins in three jumps. After his initial success in Cork, Jim competed as a standing jumper whenever possible and usually won. Jumping from a stationary position and thus transforming concentrated power into action is a natural Celtic gift at which he excelled. It is said that he didn’t formally train in those days, or worry in any way about his diet... he just went along to meetings where the three standing jumps were on the programme and simply jumped further than anyone else. At the Olympic Games in 1906 in Athens Jim broke the world record for 3 standing broad jumps and won the crown for the single broad jump. 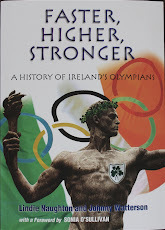 He also represented Ireland by taking part in the games in Stockholm, Rome and Paris. In 1908 Jim moved to Chicago where he continued his athletic success. He was granted membership of the Illinois club and competed for several years without being beaten. Another peak of his career came when he broke the world record in 1923. In addition to his performances as a jumper he was a lifelong supporter of the G.A.A. and was involved with the organisation of Gaelic games in Chicago. He personally welcomed and hosted the Tipperary Hurlers when they played and won in Chicago in 1926. In spite of his relocation to Chicago, Jim returned home many times and it is said that his heart always remained in Galbally. He married a woman from North Tipperary and they had one son who became a priest. In addition to his sporting legacy, Jim inspired great affection and respect, and was known as a good family man and friend.